Safely store and transport 7" Usuba and Santoku knives and 8" chef's, bread, and carving knives among other 7"-8" knives with the Mercer Culinary M33115P 8" x 1 1/2" blade guard! Made of black polypropylene, this simple yet effective edge protector ensures the fine blades of your knives stay sharp and in perfect condition. This is a great product, I have had it on my knife in my knife bag for over 6 months and no cracking has occurred, which is impressive because they usually only last me 3 months before I have to tape them. I have this guard on my fillet knife and it fits great. My fillet knife is a little thinner but it still fits fine. I would get these blade guards with any knifes just for safety and to save the blades edge it’s self. Plus their affordable and well made. This is made from a good quality, tough plastic. This size is perfect for my shorter, smaller knives. They do fit snug at the top and don't fall off or slide around. I would recommend this. The 1.5 inch blade guard is perfect for my boning knife or any thinner blade. For a while I only had the 2 inch and they take up more room. Durable guard. We bought a variety of sizes for our congregation's kitchen. Previously, the knives were all thrown in a drawer, which was neither good for the blades nor the people reaching in the drawer for knives. Instead of having dull and damaged blades, we can now keep our knives super sharp and protected. Surely a great buy to ensure safety for yourself and protect your knives from elements of the world and something damaging them by accident. This guard keeps a snug grip to the knife and can only be taken off with force, won't just slip. This blade guard is designed well. It fits well on my chef knife and it is well made. It will not break or tear easily. Great polypropylene blade guard that is both sturdy but not too . Protects knives well, allowing travel with them or storage in a drawer of knives. The Mercer knive guard s a good addition to my collection of knives. The guard goes on easy and has a tapered top for safe application. 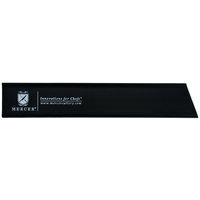 This blade guard is great for transporting sharp knives to and from events, or even in a drawer. It covers the blade completely and is tight fitting. This blade guard does an excellent job at protecting knives and protecting surroundings from knives! Easy to slip on and off, yet it stays put. Priced well. It is very important to protect your high-end knives when they are not in use. This plate guard is 8 inches long and 1 1/2 inches wide. It is made of polypropylene and will protect your knives when they are being transported or in storage in your kitchen. These blade guards are a very inexpensive way to keep your knives sharp. These are outstanding: I have many in different sizes and Webstaurant has the best prices on them. Easy to use, effective, and I've only managed to break one of the little 6 x 1's after hard usage all these years. Highly recommended. THESE MERCER M 33115P 8" x 1 1/2" POLYPROPYLENE BLADE GUARDS FROM WEBSTAURANT ARE THE BEST PRICE AND THE BEST QUALITY...THEY FIT MY NEW KNIVES PERFECTLY...PROTECTING THE SHARPNESS AND MY HANDS DURING STORAGE...BUILT WELL,GREAT VALUE AND JUST WIPE OFF TO CLEAN..
We take care of our knives to the best of our ability and this blade guard is a inexpensive way to protect the blade to the best of our ability. For anyone who travels with knives, blade protection is a must - even in a knife roll. I’ve used similar products from other brands and they have all cracked on me. This Mercer product seems a little sturdier so time will tell how it will hold up. I like that one end is cut at an angle. This allows for greater blade protection near the handle. very nice knife blade guard. I use it with the Mercer 8" chef knife and I feel confident that even though that is a sharp knife, the knife is secure inside it. This blade guard is a life saver - fits perfectly with all the mercer knives and is a great way to keep hands of all in the kitchen safe and cut-free. Have one for every knife in our kitchen. These are great, I buy them for all my knives. This product keeps blades sharp, do not have to worry about damaging your blades. Highly recommend product. The mercer blade guards help protect your knives during storage and transport. Helps keep the knives protect from dings and protect you when reaching for them in your tool kit. I buy these for all the knives we use at some of our locations as well as chef and managers' knife kits. They are a must have. the blade guard is perfect for keeping blades sharp and fingers safe while storing in a drawer. every knife not in a block has one of these and its great. Very good product, nice quality and does what it is intended to do. Price is very reasonable as well. I would recommend this and would buy it again. I am very pleased with this knife guard. It holds a very firm grip on the blades which keeps it secure in a knife case and subjected to motion. The angled edge is great for any knife with a bolster. Overall I am very satisfied with this product, would buy again. Used the Mercer M33115P 8" x 1 1/2" Polypropylene Blade Guard on my Dexter-Russell 29383 V-Lo 8" Scalloped Utility Knife. This knife is also sold through webstaurant. So glad I can protect my knife. Excellent blade guard! Because of space requirements I have to store my knifes in a drawer and this is the perfect solution to protecting my hands and the blade. Made of solid plastic and has quite a tight grip on my Ikea 8" Chef Knife (this fits it quite well). Great edge guard , they keep a nice snug fit on the knife they are very clean and don't have any off odors after use;n they also work well for different shapes and lengths knives that other guards just don't fit. These are really nice blade guards they are tight and will not easily slide off of your knife blade. I have several of these and will buy more when needed. I've tried many different types and styles of blade guards, and these are my favorites to date. They're excellent for transporting knives safely, and they're also great for knives that are stored in a drawer. They're simple and inexpensive, and they do exactly what they were designed to do. Highly recommended. The 8" X 1 1/2" size is good for a filet knife. If you're looking for a blade guard for an 8" chef knife, go with item # 470M33113P. I love these Mercer blade guards. I have purchased several other brands in the past, but none of them compare to the perfect fit of these! The Mercer blades are so sharp, I am so grateful that these covers exist! I use this cover with my 8" knife and they keep the knifes sharp, and safely tucked away! Essential little cover for knives that travel. I give one to everyone I give a knife to so that they can store it without damage and take it with them without cutting holes in things. Cheap insurance. Keeps you safe from cutting yourself every time you reach your hand into your knife bag(s). Especially with sharp knives or new knives. THis is a must have. Perfect blade guard for protecting the knives that aren't used on a daily basis. The knife in the guard fits safely in the drawer and stays sharp without cutting fingers. Looking for a blade guard, I came across this inexpensive model for my knife that I recently purchased. The guards hold the knife very snug. Some of the heel of the knife does stick out so be careful where you place the covered knife when done. Overall a good buy for the price and would recommend! The Mercer cover perfectly safeguards the Dexter Filet knives I ordered. Every time I demonstrate how the covers protect the knives, the Sportsman I sell them to are impressed. This is a great knife cover. Something most people don't know is that the primary reason knives lose their blade is not from cutting things it's from being tossed around in drawers or in washing. This protects my blades very well! Great knife cover! Built by Mercer but can easily protect any brand of knife that fits the size! A price that will easily make keeping the blade sharp a no brainer!! !